Antifascist protester shot by Trump supporter amid mass counterprotest on UW campus, but Yiannopoulos spins a tale of martyrdom to his audience at end of speaking tour. 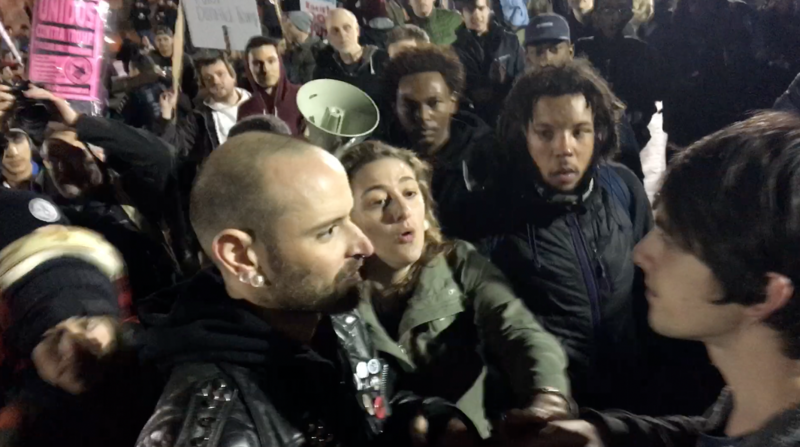 It was a scene ripe for violence last Friday night in Red Square on the University of Washington campus in Seattle: Several hundred fans of the racist "Alt-Right" figure Milo Yiannopoulos outside the hall where he was to speak, waiting to be let in, confronted by a much larger crowd of counter-protesters, chanting anti-Trump and anti-fascist slogans, including an organized pack of masked, black-clad anarchists. Eventually, violence did strike. An antifascist protester was shot during one of the many small melees that broke out during the evening. Police said a 34-year-old man was seriously wounded by the gunfire and was in critical condition at a local hospital after undergoing surgery. A man earlier identified as a “person of interest” in the case – described by the Seattle Times as an Asian man in a black leather coat with a maroon shirt underneath – turned himself in to police later and was arrested along with a man who accompanied him to the station. Both were later released without charges. Afterwards, Yiannopoulos and Breitbart News, where he is a celebrity editor, attempted to cast his supporters as the martyrlike victims in the shooting. However, Hatewatch’s eyewitness version of events is precisely the reverse: The shooter was a Trump-supporting man who had been acting as a provocateur in the crowd all night, while the victim was an anti-fascist liberal who had been acting as a peacekeeper in the moments before he was shot. Yiannopolous event invites chaos, violence. Yiannopoulos' talk – at the invitation of the school’s College Republicans chapter – had created a controversy beforehand, with many critics questioning the university’s decision to permit hate speech on campus. UW officials were firm in their decision, defending it as a First Amendment matter. When the doors to the event opened, the counter-protesters quickly moved to block any further entrance to the event. Press reports indicated that several hundred managed to make it in – the Times estimated about half of the auditorium’s lower bowl, which holds some 530 seats, was full. However, the remaining crowd with tickets to the event remained stuck outside. Eventually, the verbal exchanges that began taking place in increasingly denser conditions became physical shoves, and then punches. One young Trump supporter made the mistake of directly approaching a phalanx of masked anarchist “Black Bloc” protesters and was punched in the mouth and hit in the face with a blue paint ball. He was later rescued by his father. The eventual shooting victim is seen peacefully interceding in a near-melee moments before he is shot. Around that scene, a handful of melees began breaking out. A Hatewatch reporter was assaulted from behind by a black-clad anarchist who kicked his recording device away, while angry anti-fascists began tussling with Alt-Right fans in the area. It was amid that chaos that one of the Trump fans pulled a gun and shot one of the anti-fascists – a tall man with a black leather jacket who had been acting to intercede as a peacekeeper – with a single shot that many people in the vicinity did not even hear. “If I stopped my event now, we are sending a clear message that they can stop our events by killing people. I am not prepared to do that," Yiannopoulos said. His mostly youthful audience eagerly congratulate themselves. Outside, the shooting galvanized the protesters, who increased their ferocity. Most of the remaining Yiannopoulos fans began clearing out. The protest crowd outside remained for most of the talk and lingered well afterward, so police wound up escorting most of the audience outside via a tunnel that exited through a nearby parking garage. According to the Times, the man accused of the shooting told police that he fired the gun in self-defense and claimed that the man he shot was a “white supremacist.” However, friends of the victim (who remains officially unidentified) contest that characterization, saying he was a liberal anti-fascist sympathizer. Yiannopoulos’ pronouncement at the speech clearly attempted to cast the Alt-Right as victims of the shooting. Breitbart News, where Yiannopoulos is the tech editor and chief provocateur, reported the shooting as having been perpetrated by the anti-fascist protesters. That was clearly not the case. One of Milo’s young fans, bedecked in furs and sunglasses, afterward gave an interview – posted by Yiannopoulos – conveying that similarly confused mischaracterization of the events outside.